5 in 1 multifunction 15" x 12" heat transfer press t-shirt sublimation machine, this 5 in 1 heat press machine can be used for t-shirts, caps, ceramic plates, ceramic tiles, mugs, coasters, mouse pads, jigsaw puzzles, lettering, other misc. Fabrics & materials. It can transfer colorful pictures and characters of sublimating and dissolved printing ink onto ceramics, glasses and textiles such as cotton, flax, chemical fiber, nylon, etc. This all-in-one press includes flat platen, mugs and plates. The swing-away heat press boasts all of the must-have attachments. The digital timer control is adjustable up to 999 seconds. The features a digital temperature gauge ranging from 0 - 250ºc (about 480ºf). Item specifications: Power input: 110V, wattage: 1400W, cord length: 4.5'. Hat/cap press: 6"x 3" (curved), mug press: 3"-3.5" diameter (11oz), plate press 1: 5" max diameter, plate press 2: 6" max diameter. Feature: Large 12" x 15" transfer element, digital LED temperature and time controller, full 360-degree rotation of swing-away design, Fahrenheit and Celsius scale are selectable, full-range pressure-adjustment knob, 2 4/5" long arm handle, bold handle easy to hold, save effort design, sanding surface, comfortable felling, automatic electronic timing when single table integrated, automatic alert when processes complete, built-in fuse for safe using, slides design make the changing of the parts easier and fast, save your time and effort. 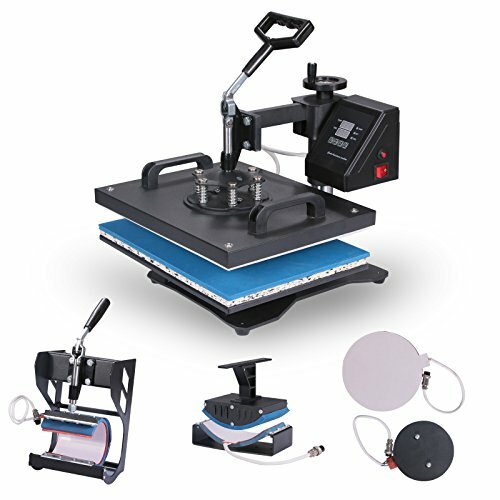 Package content: 1 x fully assembled heat press machine, 1 x hat press, 1 x mug presses, 2 x plate presses, 1 x removable silicone pad and cotton pad, 1 x operating manual.